Crossrail’s Latest Issues Begs The Question, How Do We Judge Success In Transport Megaprojects? The title of this post is the same as this article on Forbes. The article makes some interesting points about transport megaprojects. It is definitely a must-read. As an example of a megaproject that went wrong, it cites the Channel Tunnel, which exceeded its budget by 80%, required refinancing and then Eurostar only carried a third of forecast traffic. This article on the BBC, which is entitled How Eurotunnel Went So Wrong, gives the full story of the Channel Tunnel finances. So should it now be closed? Obviously not, as the alternatives of driving and flying would create a lot more unwanted carbon dioxide and would need more motorways and airports. The benefits of building Crossrail, such as increasing the capacity of London’s transport system, reducing congestion in Central London and giving better access to Canary Wharf, East London, Heathrow, The City and West London will just come in a year or so later. The article also says that according to Oxford professor; Bent Flyvbjerg, Crossrail is suffering a 7% cost overrun, where the average for rail projects is 45%. In my view Crossrail has suffered from a number of problems that together have caused the cost and time overruns. Not enough time was built into the schedule to test the sophisticated trains with their three signalling systems. No dedicated Crossrail test track was created, so the trains could be fully tested. An unfortunate transformer explosion, was a big cause of delay in testing systems. There were not enough workers to finish the project. Central London is awash with large projects, some of which became viable because of Crossrail, that are sucking up masses of workers. Brexit uncertainty has meant that a lot of EU workers have gone back to Europe to build projects nearer their homes. Where was the European project supremo, who added up all the needs of these European megaprojects, to make sure, we had enough resources to build all of them on time? The title of this post is the same as that of this article on Building. 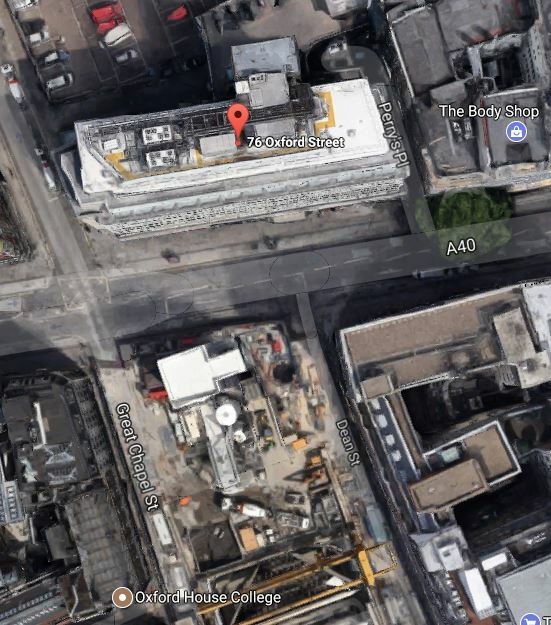 Three firms are in the race to build a new £50m office block above the Crossrail station at Bond Street. It just shows how much is being pumped into London to develop office and housing complexes. Various groups and councils regularly ask if there could be an extra station on Crossrail, that would be convenient for their needs. Can Extra Stations Be Accommodated In The Timetable? There is not much point in building an extra station, if it means that a realistic timetable can’t be achieved. Every station stop will introduce a delay intro the timetable. The train may only be stationary for thirty seconds or so, but there is extra time in the braking and acceleration either side of the stop. But the Class 345 trains have been designed so that the times to execute a station stop are minimised. The trains have been designed with eight motored cars out of a total of nine. This high-proportion of powered axles gives the trains acceleration and deceleration, which is fast, but well within the levels for passenger safety and comfort. The trains also have regenerative braking, which is powerful and smooth. At times on the current service between Liverpool Street and Shenfield, I have noticed the trains waiting at stations for a couple of minutes, to allow the timetable to catch up. These trains have the performance to execute a station stop in the smallest time possible. The trains have been designed with wide double doors and spacious lobbies. This enables fast unloading and loading of passengers at each station. Trains and platforms could be arranged, so that all passengers can embark and disembark as fast as possible. As much of the route uses modern digital signalling and the trains have a comprehensive driver assistance system, the trains should be driven to a high degree of precision. All of these factors will make it possible to execute station stops very quickly. Thus, if it is desired to add a new station stop, the stop might only add a few minutes to the timetable. You wouldn’t want to add half a dozen stops between Stratford and Shenfield, but the odd stop here and there shouldn’t be a problem! Could Extra Stations Be Added In The Tunnels? I would hope that Crossrail’s design process wouldn’t have left out an important station in the Underground sections of the line. In my lifetime only one station has been added to a line after it opened, except on an extension. That station was Pimlico on the Victoria Line, but that was a late addition to the project and opened within fourteen months of the opening of the rest of the line. I think, that I can safely say that from the history of London’s extensive network of underground railways, that it would be extremely unlikely to add a new underground station to Crossrail. But I think though the following could happen. Even these will be extremely unlikely, if Crossrail have done their planning thoroughly. But then there are massive property developments, sprouting up all over Central London. One of London’s latest signature office developments, the Norman Foster-designed Bloomberg London will incorporate an entrance to Bank Underground station. Hopefully, the entrance will open soon. Bank station’s new step-free entrance will also incorporate a massive office development on the top. If a property developer is spending around a billion pounds on a development, and it can be connected to a station, they will seriously look at doing it. I can’t believe that no new developments will want to have an entrance to a Crossrail station. 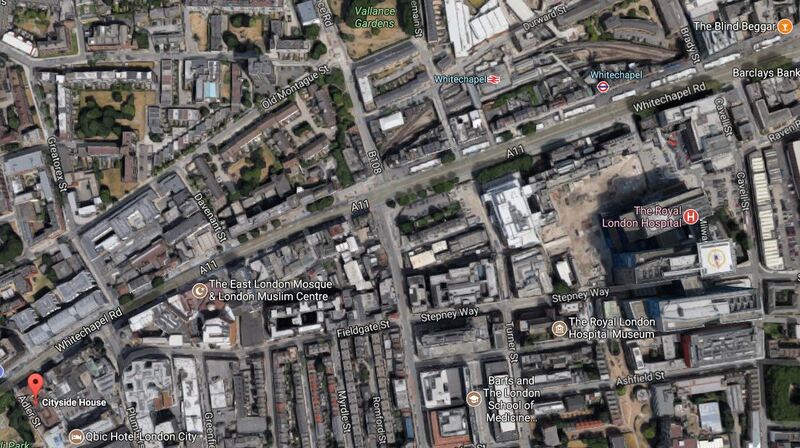 The current site of the Museum of London is too small and difficult to find. The Museum is planning to move to Smithfield and will be very close to Farringdon station. There is a massive over-site development on top of the station, that I wrote about in TfL Gives Go Ahead To Build Above Farringdon Station. This Google Map shows the relationship between the station and the new site of the museum. The building with the light-green roof is the Poultry Market. Thameslink runs under the Poultry Market. The basement of this Poultry Market together with the site to its West and the triangular site to the South, will be transformed into the new Museum of London. 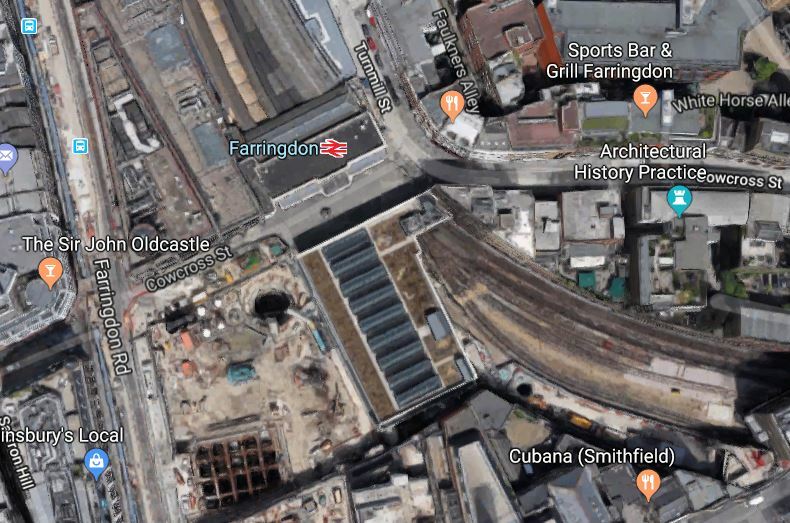 Much of the space between the Poultry Market and Farringdon station is a Crossrail work-site and whole area is ripe for development, which must surely incorporate some form of connection between the Museum and Farringdon station. Farringdon, which for many years was just a meat market surrounded by a lot of low grade buildings, should evolve into a visitor attraction in its own right. 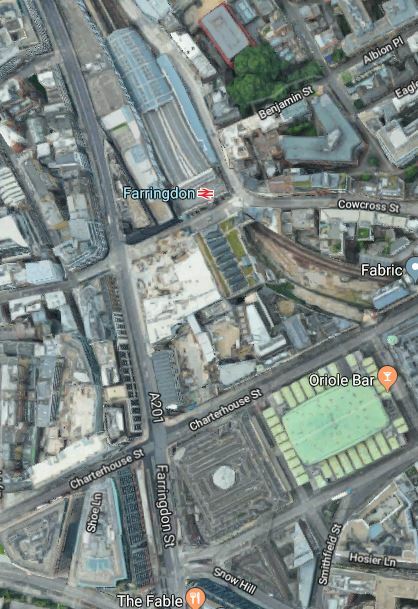 For a better look at the current state of the area, visit A Detailed Look At The Space Between Farringdon Station And The New Museum Of London Site. As a Friend of the Museum of London, I am looking forward to what will happen! I don’t think many, who use Liverpool Street and Moorgate stations understand what will happen when Crossrail opens. 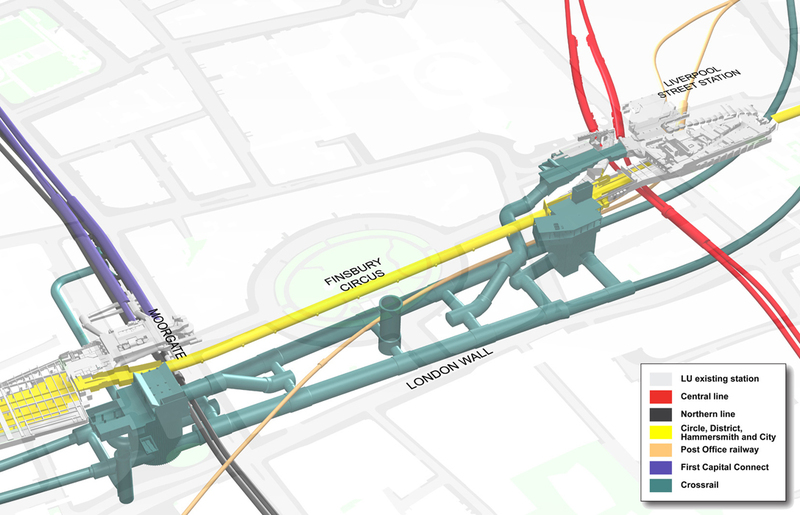 This visualisation shows the below-ground elements of the Crossrail station, that will connect the two current stations. On the right is the Central Line, which is shown in red and continues South to Bank station under Bishopsgate. On the left is the Northern Line, which is shown in black and continues South to Bank station. The Circle, Hammersmith and City and Metropolitan Lines, which are shown in yellow. The ventilation and evacuation shaft for Crossrail in Finsbury Circus. This Google Map shows the area of the stations. Note Finsbury Circus in the middle. I would not be surprised if some redevelopment has access into this mega-station complex, that stretches either side of Finsbury Circus. This access needn’t be below ground, as I strongly believe that the City of London will become virtually traffic-free in the next ten years. One of the omissions in the design of Crossrail, is the lack of a link to both the Piccadilly and Victoria Lines. By 2024, these two lines will be running at least thirty-six trains per hour (tph) in both directions. The capacity of Crossrail in each direction could be thirty tph each carrying 1500 passengers or 45,000. Dear Old Vicky’s current trains hold 876 passengers, so if she achieves the magic forty tph, which I believe she will, then this equates to just over 35,000. Siemens will surely ensure, that the capacity of the Piccadilly Line will at least be as high, as that of the Victoria Line. It is just amazing to think what might be squeezed out of twentieth-century infrastructure, some of which is over a hundred years old. This is the easy interchange between Crossrail and the Victoria Line. Oxford Circus station is full-to-bursting and will be rebuilt in the next few years, with wider platforms, more escalators and full step-free access. 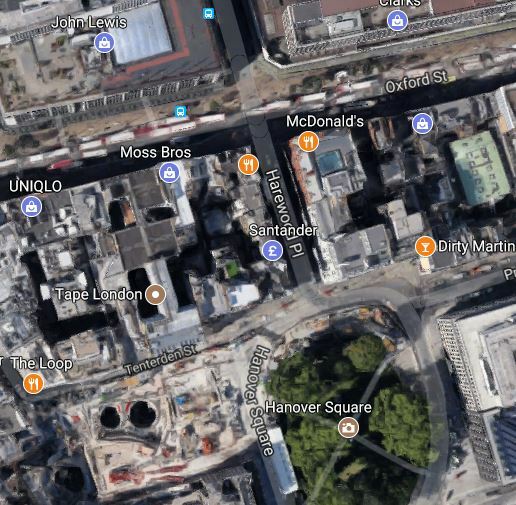 I also think, that provision of an easy walking route to the Hanover Square entrance of Bond Street station will be provided, either by pedestrianising much of the area or perhaps building a pedestrian tunnel with travelators. It is probably less than two hundred metres to walk on the surface. Coupled with some property development along the route, there must be possibilities for an innovative scheme, that would ease passengers on routes between Paddington and Heathrow and North and East London. I took these pictures, as I walked between Oxford Circus Tube station and Hanover Square. This Google Map shows the route from Oxford Circus station to Hanover Square. In the simplest scheme, part-pedestrianisation of Hanover Square and Princes Street might just do it! 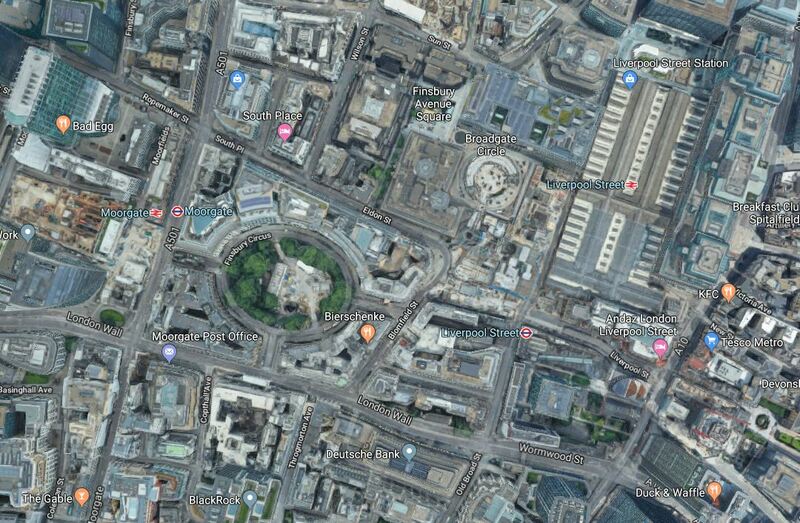 A new entrance to Oxford Circus station could also be constructed in the middle of a large pedestrian area, at the shut off junction of Princes Street and Regent Street. A short tunnel would connect the new entrance, to the rebuilt.Oxford Circus station. Walking wouldn’t be long, with the possibility of a wait in the gardens in the centre of Hanover Square. Appropriate retail outlets could be placed along Princes Street. Crossings with lights would enable pedestrians to cross into and out of the gardens. Was this always Transport for London’s plan to link Crossrail to the Victoria Line? It’s certainly feasible and works with little or no construction. Finsbury Park station has two direct routes to Crossrail; Thameslink to Farringdon and the Northern City Line to Moorgate and could have a third if the Victoria Line has a better connection at Oxford Circus/Bond Street. Passengers needing to use Crossrail from the Northern reaches of the Piccadilly Line could walk across the platform to the Victoria Line and then use the Oxford Circus/Bond Street connection. It is not a perfect route, but if Finsbury Park were to be upgraded to a passenger-friendly interchange, it would be a lot better. So it looks like, it will be Vicky to the rescue again. Never in the field of urban transport was so much owed by so many to a single railway built on the cheap. Holborn station is due to be rebuilt with a second entrance in the next few years. Crossrail passes under Holborn station. After rebuilding, Holborn station will probably offer the best interchange to an East-West route from the Piccadilly Line. To add extra platforms on Crossrail, would probably mean long closures on the line. It is one of those projects, that can be done, but not without immense disruption. But at some point in the future, it is a link that could be added, so I wouldn’t be surprised to see the expanded Holborn station will have provision for a link to Crossrail. Usually, when you look at old maps of railway lines there are a number of places, where stations used to be. However, between Reading and Shenfield stations, there is no station that has been closed. There is a site for Crowlands station that was planned near Romford, in the early twentieth century, but was never built. No-one is suggesting it should be opened now. So where are stations planned or proposed? In fifteen years or so, Old Oak Common station could be one of the most important non-terminal on Crossrail. Current plans say that the following lines will call at the station. In addition the following lines may call. It could become a very comprehensive interchange station. 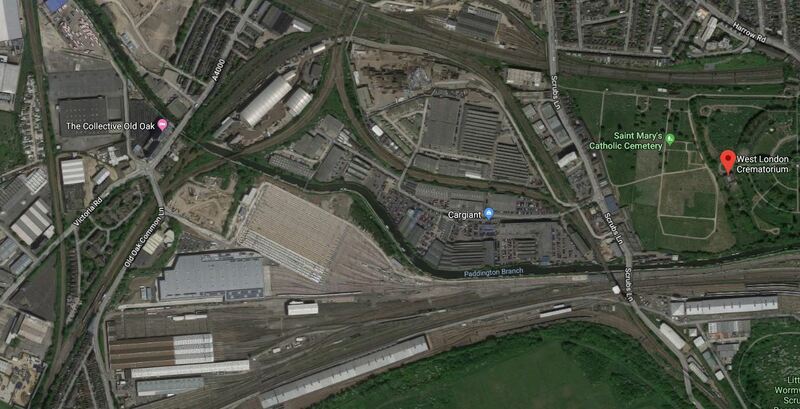 This Google Map shows the vast Old Oak Common site. The Grand Union bisecting the site in an East-West direction. The inverted-Y of the Overground, with North London Line to Richond going South-West and the West London Line to Shepherds Bush going South-East. The Great Western Main Line going East-West across the bottom of the map. The West Coast Main Line going East-West across the top of the map. The Dudding Hill Line going North-South at the Western side of the map. Between the Grand Union Canal and the Great Western Main Line, there are currently four rail depots. From South to North, they are. Hitachi’s North Pole depot, where they service the Class 800 trains for Great Western Railway. The Great Western Railway depot. The Heathrow Express depot is due to be demolished to make way for the new Old Oak Common station. The High Speed 2 line will be below ground level at the Old Oak Common site, with the parallel Great Western Main Line and Crossrail tracks on the surface to the south. This map from Wikipedia, shows how the lines connect. Considering that the High Speed Two tracks are below the surface and the Crossrail and Great Western tracks will be on the surface, I am fairly sure that a simple clean interchange will be created. The different levels will also mean that if say there were to be a Crossrail branch to Watford or High Wycombe, then the High Speed Two tracks are well out of the way. The High Speed Two platforms will be almost four hundred metres long, with the Crossrail and Great Western platforms probably about half as long. This should give lots of scope to create good connections to the other lines through the station. 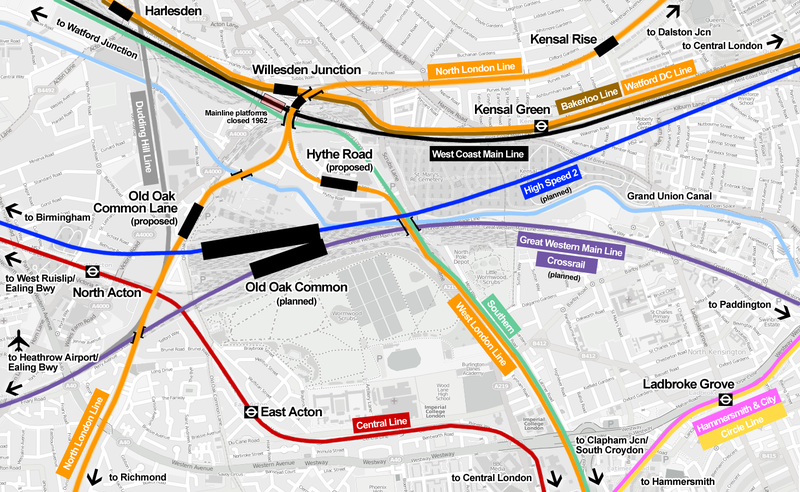 The new Old Oak Common Lane station will be on the North London Line between Stratford and Richmond stations, will be the way I access High Speed Two from Dalston and it will be 350 metres West of the main station. The West London Orbital Railway could have a station on the Dudding Hill Line, which runs to the West of, but close to Old Oak Common Lane station. The new Hythe Road station will be on the West London Line between Stratford and Clapham Junction stations and will be 1100 metres from the main station. Hythe Road station will incorporate a turnback platform for services from Clapham Junction. It would be ideal for a service between Gatwick Airport and High Speed Two. It should not be forgotten that there is going to be a large number of houses built around Old Oak Common. It looks to me that if I took the wrong train from Dalston Kingsland station to get a High Speed Two train to Birmingham or the North, I might end up at the wrong end of my double-length High Speed Two train, with a walk of up to 1100+400+350 = 1850 metres to get to the required place on my train. I would hope that the High Speed Two station would have some form of high-tech people mover, that stretched across the station site. It could be like a cable car without the cable. Hopefully, the designers of Old Oak Common station will create what needs to be one of the best stations in the world. Wikipedia says this about adding a station for London City Airport. Although the Crossrail route passes very close to London City Airport, there will not be a station serving the airport directly. London City Airport has proposed the re-opening of Silvertown railway station, in order to create an interchange between the rail line and the airport. The self-funded £50m station plan is supported ‘in principle’ by the London Borough of Newham. Provisions for re-opening of the station were made in 2012 by Crossrail. However, it is alleged by the airport that Transport for London is hostile to the idea of a station on the site, a claim disputed by TfL. This Google Map shows the Western end of the terminal at London City Airport and the Docklands Light Railway running to the station at the Airport. The Southern portal of Crossrail’s Connaught Tunnel can be seen under the DLR at the left end of this map, due to the concrete buttresses across the cutting rebuilt for Crossrail. Surely, it would not be the most difficult of designs to build a station, somewhere in this area, where the former Silvertown station once stood. I said more about this station in August 2017 in Action Stations On Crossrail Howler. I will be very surprised if this station isn’t built. If Ladbroke Grove station is built, it will because of property development. Wikipedia says this about current plans. At a site just to the east of the Old Oak Common site, Kensington and Chelsea Council has been pushing for a station at North Kensington / Kensal off Ladbroke Grove and Canal Way, as a turn-back facility will have to be built in the area anyway. Siting it at Kensal Rise, rather than next to Paddington itself, would provide a new station to regenerate the area. Amongst the general public there is a huge amount of support for the project and then-mayor of London Boris Johnson stated that a station would be added if it did not increase Crossrail’s overall cost; in response, Kensington and Chelsea Council agreed to underwrite the projected £33 million cost of a Crossrail station, which was received very well by the residents of the Borough. Transport for London (TfL) is conducting a feasibility study on the station and the project is backed by National Grid, retailers Sainsbury’s and Cath Kidston, and Jenny Jones (Green Party member of the London Assembly). This Google Map shows the wider area. Ladbroke Grove is the road running North-South at the right side of the map. Canal Way is the twisting road running North of the railway. Sainsbury’s supermarket is North of Canal Way. The cleared site of the old Kensal gasworks is earmarked for housing. The Crossrail tracks are on the North side of the railway, so access from a station to the housing could be very easy. Crossrail is not even open yet and it looks like when it does, it will start a large number of projects to expand its scope. Some will be about extending the system, some about better transport links and other about property development. Crossrail will be an unlimited opportunity for London and the South East. The title of this post is the same as this article on New Civil Engineer. 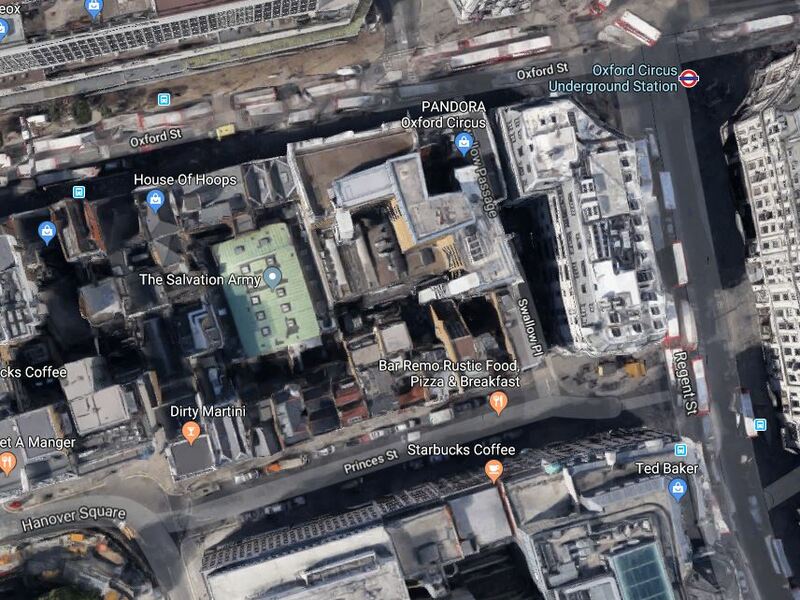 Transport for London (TfL) has signed an agreement with developer HB Reavis to build an oversite development above the new Farringdon Elizabeth Line station. TfL said the new seven-storey, mixed use building was part of a huge programme of Elizabeth Line property development which could raise £500M to be reinvested into improving transport in London. The article then goes on to add more detail about this development and a dozen or so others under development or construction. I took these pictures at Farringdon station this morning. This Google Map shows the site. The site is between the station and Farringdon Road. I feel that the site will be a very well-connected one. There is a direct rail connection to Gatwick, Heathrow and Luton Airports. Eurostar is one stop away on Thameslink. There is a direct rail connection to Euston, Kings Cross, Liverpool Street, London Bridge, Paddington and St. Pancras stations. Many of London’s Central attractions are easy to access. Could it become an up-market hotel? 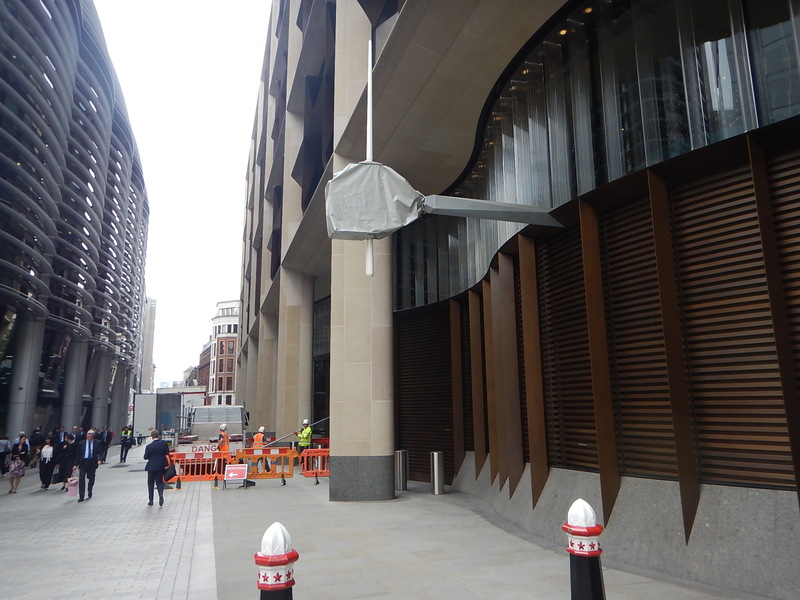 These pictures show the Barbican station end of the Crossrail entrance at Farringdon station. Note the design in the glass. This article on Property Week is entitled Helical To Build £120m Office Over Farringdon Station. It looks like the building of this block is starting. The title of this post is the same as this article on City AM. The number of homes and jobs created due to the development of the £14.8bn Elizabeth Line is set to greatly surpass expectations, according to a new report by commercial property agency GVA. The research, commissioned by Crossrail, found that the impact of the new railway on the creation of new homes and impact on property value, is set to be significantly greater than GVA originally predicted in a 2012 report. GVA expects 90,599 new homes along the route by 2021 – higher than the 57,000 new homes predicted in the previous report. GVA also expects a £10.6bn increase in property values within 1km of an Elizabeth Line station by 2021. Although, there are lies, damned lies and forecasts from property consultants, the significance here, is that both surveys were done by the same company. From personal experience, I know that London’s last big railway project, the Overground, had a similar beffect. I think these and other rail developments will increase property development and values in the next few years. Birmingham electrification and new train fleet. Southend Branch improvement and new trains. Before buying a house look at what is happening to the trains and trams. I’ve heard it several times, that the title of this post is the three most important things about property. This article on Construction Enquirer is entitled Great Portland Estates Plans Work on £233m Trio Of Schemes. The block is indicated by a red arrow. It is a short walk from Whitechapel station, which is served by Crossrail. The office accommodate is being upgraded and residentialo and a hotel will be added. The building site opposite is the under-construction Western entrance to Tottenham Court Road station, which is served by Crossrail. Tottenham Court Road station is just thirty minutes to Heathrow on Crossrail, with a train every ten minutes. The block is to be redeveloped. Is there a better location for an office block? The site is on the North-West corner of Hanover Square. The building will be on top of the Hanover Square entrance to Bond Street station, which is served by Crossrail. Bond Street station is just twenty-seven minutes to Heathrow on Crossrail, with a train every ten minutes. I doubt Great Portland Estates will have problems filling this development. These three property developments are all tightly tied to Crossrail. There will be many more!